The Access to Medicine Foundation and Bio Ventures for Global Health have developed a framework for identifying which IP assets are most likely to accelerate research into the medicines and vaccines needed by people living in low- and middle-income countries. Pharmaceutical companies have deep expertise in the research and development (R&D) of new medicines and vaccines. In addition to conducting R&D in-house, they can accelerate R&D by sharing intellectual property (IP) assets with third-party researchers. This is a largely untapped approach, particularly for supporting the development of new and adapted products for people living in low- and middle-income countries (LMICs). 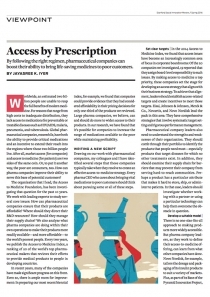 In recent years, IP sharing for R&D has been pioneered mainly in the neglected disease space, for example by pharmaceutical companies opening up their compound libraries and data vaults to independent research groups. Importantly, IP-sharing agreements have the greatest potential public health benefit when they include terms for ensuring resulting innovations are rapidly made accessible for populations in LMICs. In collaboration with BIO Ventures for Global Health, the Access to Medicine Foundation has now developed a new framework for evaluating industry IP-sharing agreements for R&D. The framework will be used for the first time as part of the 2018 Access to Medicine Index analysis. The framework compares different IP-sharing agreements in terms of risk, effort and potential value to accelerating R&D. 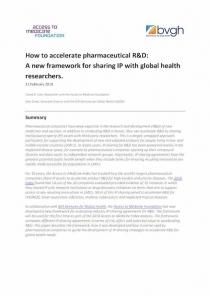 This paper describes the framework, how it was developed and how it can be used by pharmaceutical companies to guide the development of IP-sharing strategies to accelerate R&D for global health needs.